“I really want the type of thinking the player is going through to have relevancy with the conflict that the protagonist is experiencing,” says John Warner of his new episodic game. Sounds reasonable. All too often, developers seem to fit their themes to established mechanical models rather than the other way around. Why shouldn’t The Fall’s mish-mash of 2D platforming, shooting and problem-solving be tuned to reflect the larger narrative betrayed by its environments and the subject matter of its conversations? There’s just one snag. That protagonist? It’s an AI, built into the suit of an injured spaceman. The conflict at the centre of The Fall will be instantly recognisable to anybody familiar with the robotic laws devised by I, Robot author Isaac Asimov. 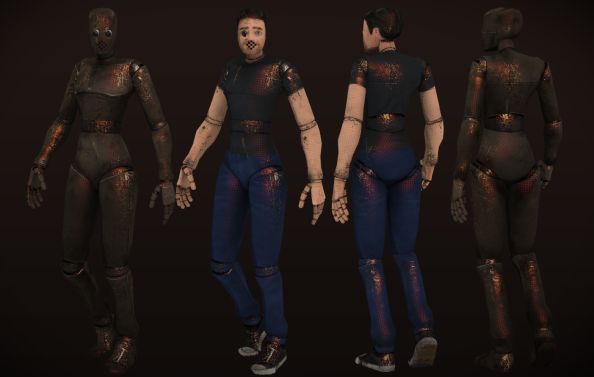 As ARID, an artificial intelligence activated when the suit’s owner is injured, you are bound to protect your charge and guide them to safety. There’s just one catch: you don’t have the autonomy required to do it. In forcing players to find loopholes in their limitations, Warner hopes to have them thinking in the same rhythms as their robotic protagonist. That way, he can explore some “high-falutin” themes like civil rights (in The Fall’s world, robots are “kind of socially and legally dead”) and self-identity (“I love getting counselling and therapy – I’m one of these weird people who thrives on coaching.”) without “getting super preachy and arty”. 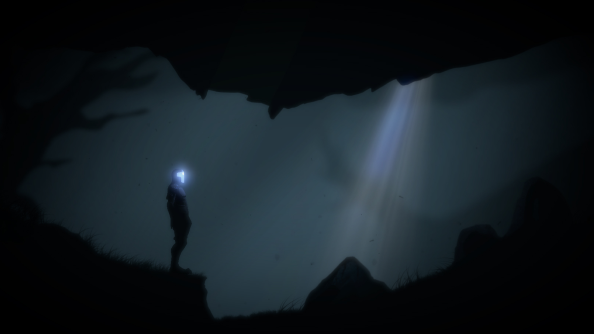 The Fall’s mechanics are similarly ambitious-but-grounded. After plenty of iteration, Warner has managed to fold his affection for Monkey Island into a platforming explorathon in the vein of Metroid. 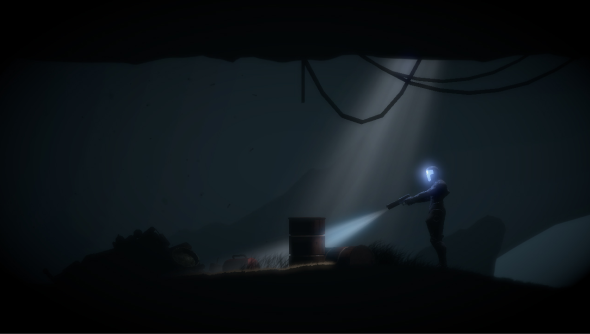 When players bring their flashlight to bear over an object in the game, they’ll highlight datapoints that allow them to interact. Upon first seeing the game, the distinction between the man in the suit and AI in control might seem academic. After all, that’s videogames, isn’t it? All we ever do is steer unconscious avatars out of dangerous situations. But Warner says that robotic laws will govern the way players approach challenges in-game. “A lot of the puzzles are themed in this way where the solution isn’t immediately apparent – you’ve got to break the paradigm or challenge it in order to solve the puzzle,” he says. “I want to continue doing that until the player and the protagonist starts deconstructing enough of these rules bounding her behaviour that she starts having choice. As we talk, Warner’s high concept explanations are often bookended by a “How do I put this” or an apology for any “psychobabble”. It’s an air I recognise from academia: of somebody so deeply involved in their creation that they struggle in translating it for entry-level newcomers like me. There’s probably a reason for that: bar the freelance sound designer, graphics designer and voice actors Warner plans to hire in the last months of development, The Fall is a true solo project. But there’s something else too: Warner had some “very painful experiences” setting up an iOS studio with a few colleagues after leaving Relic. “Compromise was a big part of it,” he says. “I don’t think that we needed each others’ support. We felt like we were on the same page but we weren’t in lots of different ways, and the truth of the matter is that we didn’t need to be working together – we just kind of did it because it’s scary starting a company, so doing it together seemed like it was a natural, easy course. The others might not agree with that sentiment, but that was how it was for me. The time and space to establish that baseline is a luxury Warner’s been afforded by the savings he’s burned through since leaving AAA games, and – fingers crossed – the Kickstarter backers who’ll fund the last six months of The Fall: Episode One’s development. Kickstarter Canada launched yesterday, prompting what will surely be a long line of talented refugees from the country’s humongous tax-subsidised crop of AAA studios to begin pitching their ideas. Warner will be one of the first. If he’s successful, though, he won’t be hiring any more full-time staff: alone, like ARID, he’ll be steering his bold idea to the relative safety of release. Find The Fall on Kickstarter and Greenlight.